Almonds is a species of tree native to the Middle East. Almond is also the name of the edible and widely cultivated seed of this tree. Within the genus Prunus, it is classified with the peach in the subgenus Amygdalus, distinguished from the other subgenera by the corrugated shell (endocarp) surrounding the seed.Seed of the Almond tree. It's special taste can be found in orgeade and liqueurs like the italian Amaretto. While the almond is often eaten on its own, raw or toasted, it is also a component of various dishes. It, along with other nuts, is often sprinkled over desserts, particularly sundaes and other ice cream based dishes. Sweet almonds are used in marzipan, nougat, many pastries and cookies (including French macarons, macaroons, financiers), noghl and other sweets and desserts. They are also used to make almond butter, a spread similar to peanut butter, popular with peanut allergy sufferers and for its less salty taste. The young, developing fruit of the almond tree can be eaten whole ("green almonds") when they are still green and fleshy on the outside and the inner shell has not yet hardened. The fruit is somewhat sour, but is a popular snack in parts of the Middle East, eaten dipped in salt to balance the sour taste. Available only from mid April to mid June (northern hemisphere), pickling or brining extends the fruit's shelf life. In Italy, sweet almonds are the base for amaretti (almond macaroons), a common dessert. Traditionally, a low percentage of bitter almonds (10-20%) is added to the ingredients, which gives the cookies their bitter taste (commercially, apricot kernels are used as a substitute for bitter almonds). Almonds are also a common choice as the nuts to include in torrone. In Puglia and Sicily, "pasta di mandorle" (almond paste) is used to make small soft cakes, often decorated with jam, pistacchio or chocolate. In Greece, ground blanched almonds are used as the base material in a great variety of desserts, usually called amygdalota (αμυγδαλωτά). Because of their white colour, most are traditionally considered "wedding sweets" and are served at wedding banquets (also in Turkey). In addition, a soft drink known as soumada is made from almonds in various regions. In Iran, green almonds are dipped in sea salt and eaten as snacks on street markets; they are called Chaqalu bâdom. In Morocco, almonds in the form of almond paste are the main ingredient in several desserts. Whole fried almonds are also used in sweet tajines. A drink made from almonds mixed with milk is served in important ceremonies such as weddings and can also be ordered in some cafes. In Pakistan and India, almonds are the base ingredients of pasanda-style curries. Badam halva is a sweet made from almonds with added coloring. Almond flakes are added to many sweets (such as sohan barfi), and are usually visible sticking to the outer surface. 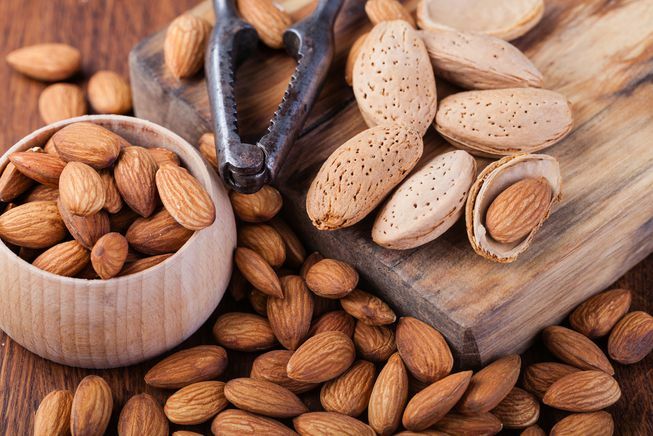 Almonds can be processed into a milk substitute called almond milk; the nut's soft texture, mild flavour, and light colouring (when skinned) make for an efficient analog to dairy, and a soy-free choice, for lactose intolerant people and vegans. Raw, blanched, and lightly toasted almonds all work well for different production techniques, some of which are very similar to that of soymilk and some of which actually use no heat, resulting in "raw milk" (see raw foodism).